Tuesday, June 5 marks World Environment Day, a day dedicated to increasing awareness and igniting the desire to protect the environment from the threats lurking over it. Every year, the day is celebrated with a special theme and agenda and the 2018 edition of the World Environment Day takes a step towards a plastic-free future. 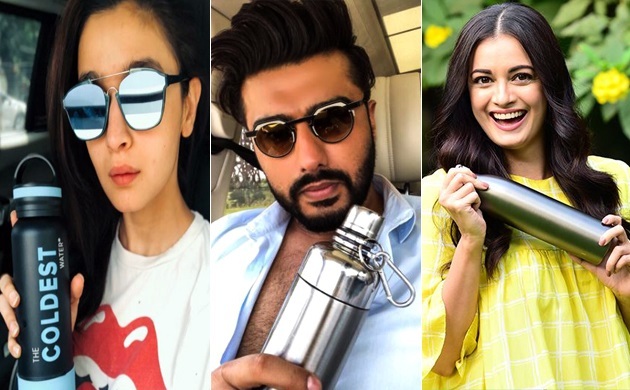 As the world is gearing up to ban the single use of plastic, Bollywood celebrities have also joined their forces, urging people to go green. Since it is not possible to make the campaign successful with only a few people are contributing to it, Bollywood actors are challenging three of their friends to join hands to let the 'Beat Plastic Pollution' campaign thrive. Joining the mission to switch her habits for a plastic free future, Dia Mirza, UN Environment Goodwill Ambassador from India, urged people to use eco-friendly sanitary napkins instead of non-biodegradable ones. The Bollywood diva also challenged Alia Bhatt to take up the 'Beat Plastic Pollution' campaign forward. "Beat Plastic Pollution by switching to steel or glass bottles today! Plastic bottles take 450 years or more to decompose, harming us and our environment. I am now one step closer towards purging plastic from my life. Hope you guys will make the switch too," Alia replied to Mirza’s request. The Raazi actress tagged Varun Dhawan, Arjun Kapoor and Sonam Kapoor to pass on the baton. Responding to Alia's tweet, Arjun Kapoor also joined the campaign and challenged his fellow actors Parineeti Chopra, Anushka Sharma and Ranveer Singh. “It takes one small step to Beat Plastic Pollution! I have replaced using plastic bottles with a metal one. It is convenient and environment friendly. Tagging Anushka Sharma Ranveer Singh and Parineeti Chopra to take up the challenge and inspire others to choose a sustainable future,” Arjun tweeted. In 30 years, there will be more plastic in the ocean than fish. I urge everyone to ban single use plastic bags. I am joining Rally for Rivers and UN environment in the fight against plastic pollution, this was Kangana Ranaut's message on the occasion of World Environment Day. The B-town diva also asked people to wear a plastic mask to understand the kind of environment is waiting to hit our future generations. "I am joining Rally for Rivers and United Nations to beat plastic pollution. Are you with me to try every bit to eliminate all single use plastic from our world?" this was actress Juhi Chawla's message for her fans across the world. The 'Beat Plastic Pollution' campaign has got a further booster as this year, India is hosting the World Environment Day, one of the most important annual event celebrated by the United Nations worldwide.